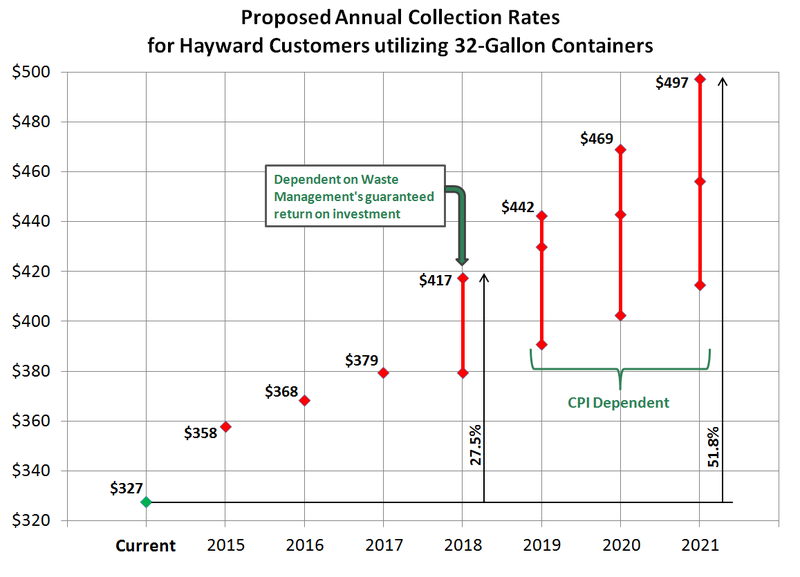 Last month, Hayward property owners and businesses received notice of proposed rate increases for garbage, recycling, and organics services. The notice provides a table that lists comparable residential rates of nearby jurisdictions. The table indicates that Hayward's rate after the proposed increase will actually be low relative to others for the first year. This is somewhat comforting, until you realize that collection rates have been increasing significantly among all local jurisdictions and will probably continue to do so. The issue will be taken up this evening as the City Council considers approving a new franchise agreement with Waste Management. The proposal now on the table could increase our garbage collection rates by as much as 27.5-percent over the next four years and as much as 52-percent over a seven year term. The staff report on the matter explains that substantial increases are necessary to stem Waste Management losses and to ensure a positive return on investment. With each passing year we're paying more and more disposal/recycling fees at the point of sale or as a property assessment--this includes fees for household hazardous waste, tires, lumber, paint, electronic waste, cans, bottles, etc. 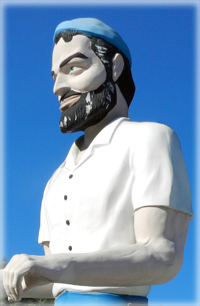 Despite all this, our rates continue to increase substantially. What gives? Beats me. The problem here is that we have a business effectively operating as a monopoly. Waste Management has been servicing Hayward for at least four decades and will apparently continue to do so for at least the next seven years. Property owners and businesses must accept this as the company has exclusive operating rights in the city--no other company can legally duplicate it services. The city yields some regulatory authority with this arrangement, but true transparency is not available to the general public. What is the company's cost of servicing Hayward? What amount of revenue is it generating here? Without competition, is it operating efficiently? Who knows? The only information readily available on the Internet is that the company posted a $270-million profit in its most recently reported quarter and that its CEO recently received over $10-million in annual compensation. Not too shabby, eh? I understand the City is requesting that additional services be provided by Waste Management, which of course would impact rate payer costs. But its not clear how a dollar of additional service costs translates to the invoice of an individual rate payer. If the proposed rate increase is due primarily to the desired additional services, then perhaps the Council needs to reconsider its wish list. Another problem, that is certainly impacting cost, is that the City is effectively taxing rate payers through the franchise agreement. This is done by charging Waste Management impact fees. The city has been charging the company a fee for street sweeping, and it's now proposing a fee for roadway rehabilitation. According to the staff report, these fees total 3.5-percent of revenue, which, of course, is passed on to captive rate payers. The result is basically a clandestine tax on property owners and businesses that was never approved by voters as required by Proposition 218. Unfortunately, in the end, we all know how this story plays out. As long as Hayward's rate payer costs are in-line with those of neighboring jurisdictions, it makes no difference whether the proposed increases are clearly justifiable or not. They're going to happen, so budget accordingly.